Ijaw youths have reacted angrily to the statement credited to the Chief of Army Staff, Tukur Brutai that the Nigerian army is preparing for operation Crocodile Smile III in the region. The attention of the Ijaw Youth Council (IYC), Worldwide has been drawn to a plan by the Nigerian military to relaunch its destructive military drill, code named: Operation Crocodile Smile III in the Niger Delta region. If the rumour is true as the Chief of the Army Staff, Lt. Gen. Tukur Brutai was alleged to have dropped the hint in press briefing then we will see it as a declaration of war against Niger Delta people. IYC will resist any attempt to relaunch this barbaric military drill in Ijaw land. We will defend our communities from further invasions by the Nigerian armed forces even if it means to stage a peaceful protest across the length and breadth of Ijaw land in Nigeria. We are not at war with the Nigerian government to be subjected to such trauma. Is Tukur Buratai telling the Niger Delta people that the region is in anyway under siege or being conquered by the Nigerian government in conventional combat? We fear that this Country is drifting towards the precipice. There is no crisis in the Niger Delta region or the South East that required another Operations Python Dance III and Crocodile Smile III. These are subtle declaration of war against these regions and they are provocative. President Buhari should not push this Country to a needless civil war. Thousands of Nigerians are being slaughtered like fowl by the terror herdsmen on a daily basis in the middle belt yet the military has not taken any dance step to the area. 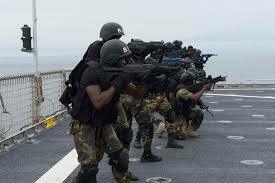 Why the South East and the Niger Delta regions are suited for military exercise? Is the Boko Haram conquered Sambisa Forest and the Fulani herdsmen terrorised Middle Belt region not good for the military exercise?